With the AIA National Convention just a few days away, AE911Truth’s outreach to local AIA chapters across the country is complete. Meanwhile, we are in the final stages of preparing for our biggest, boldest appearance ever at the convention. 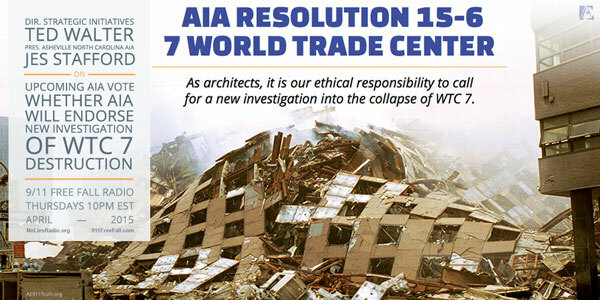 The goal, as many of you know, is to pass AIA Resolution 15-6, which calls upon the AIA to adopt a Position Statement supporting a new investigation into the destruction of WTC 7. 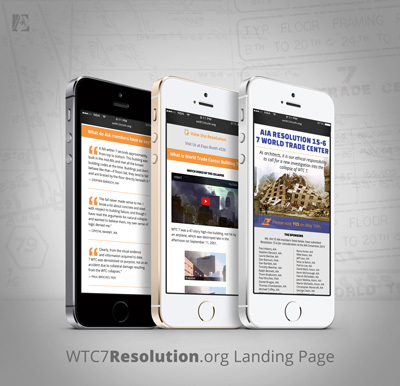 If it passes and the AIA Board of Directors ratifies it, the nation’s largest association of architects will officially support a new WTC 7 investigation. We’d like to express our sincere gratitude to everyone who helped us reach our fundraising goal, thus making this campaign possible. Here’s an update on some of the campaign tools we’ve been able to create, thanks to your generous support. This year we have doubled our booth size to 20 ft. x 10 ft. and have gone all out to make it the most professional booth reasonable money can buy. We look forward to welcoming thousands of architects into this dynamic setting, where they can learn all about WTC 7 and sign the AE911Truth petition. This is the landing page we’ve designed to inform AIA members about Resolution 15-6. Our recent email to the leaders of all 300 local AIA chapters and to members of the AIA’s national governing bodies directs them to this page. This eye-catching button will be worn by our two dozen volunteers and will be given out to the hundreds of architects who visit our booth and decide to voice their support for the resolution. Total visibility is the idea. You can receive your own souvenir button with a $25 donation to our campaign fund (still very much needed!). 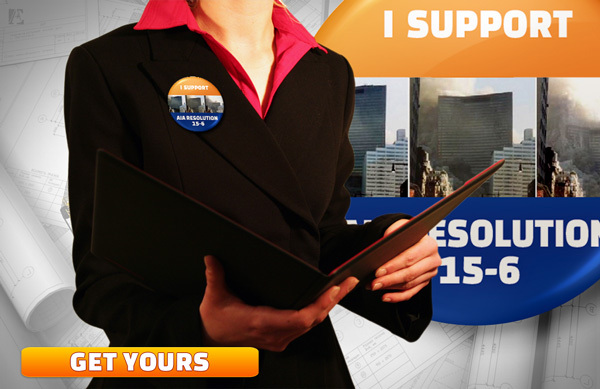 Those who’ve already donated can make a $15 donation and receive the button. This is the pamphlet we unveiled a month ago when the campaign was originally announced. It was mailed out a few weeks ago to the leaders of all 300 local AIA chapters. Also, we aim to hand out at least 4,000 copies of the pamphlet at the convention. Learn more about the AIA Resolution campaign by reading the article recently published in the Digital Journal. 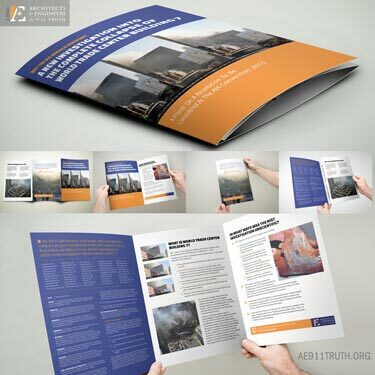 You can also get the full scoop by listening to the April 2, 2015, 9/11 Free Fall radio interview with Ted Walter and Kelly David of AE911Truth, and to the April 30, 2015 interview with Ted Walter and Jes Stafford, AIA, the president of AIA Asheville, North Carolina.